Here at Hatfield Subaru, we want to make sure that you are safe while behind the wheel of your vehicle. Just because we have sold you your current model doesn't mean we don't care about your safety. We have some tips to share with you. These tips will help you determine if you are in need of a new set of tires in the near future. Completing a tread test will give you an idea of how soon you may need to replace your tires. Place a penny inside the tread of all four of your tires. The penny should be upside-down so Lincoln is facing downwards. 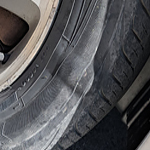 If you can see all of Lincoln's head over the tread of your tire, then you should be investing in a new set very soon. Stop down to Hatfield Subaru for more information on different varieties of tires that you can invest in for your vehicle. Is it Time to Schedule Service?